In the 80s and 90s, a lot of Japanese keshi were bootlegged and sold in 25 cent capsule machines in the U.S. and other countries. 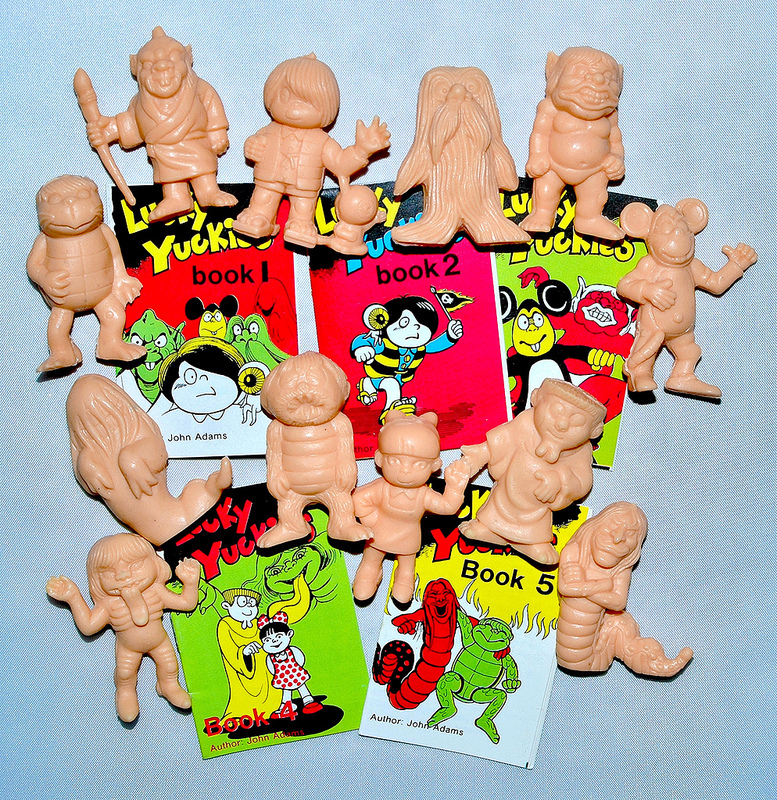 One such set was released under the name Lucky Yuckies, and used figures of characters from the Japanese manga series GeGeGe no Kitarō (ゲゲゲの鬼太郎). The Lucky Yuckies set came out in 1987, consisting of 12 different rubber mini figures and five mini booklets. The books contain bios and stories around all the characters, with the idea being that kids could make wishes on these little creatures. I assume you'd get one booklet along with each figure. There's no mention anywhere of GeGeGe no Kitarō, and all the characters were given completely different names. So as with other bootlegged capsule toys from back then, most kids probably had no idea these originated from something else. 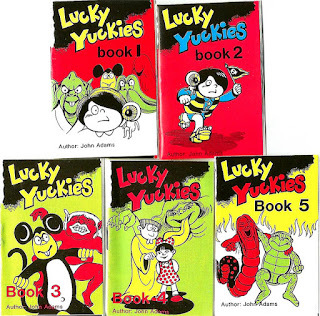 I've come across a couple different versions of Lucky Yuckies. 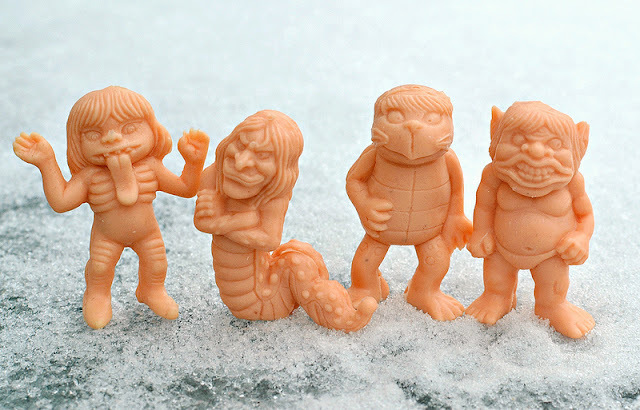 Some of the figures (including the full set pictured above) are made of a soft, flexible rubber -- even more rubbery than Monster in My Pocket figures. I also own a few of them in a firmer plastic that more closely matches MUSCLE figures. I'm not sure if they came out at different times, or if one variation is less common. Below, you can see that the firmer figures are a bit darker in color. What I love most about this set is how bizarre and wacky some of the monsters are. 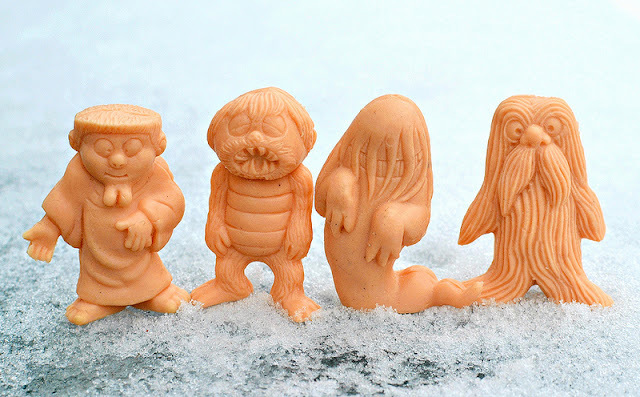 I'm not very familiar with GeGeGe no Kitarō, but these little weirdos make me want to learn more about it. I also love the fact that the writing in the little booklets is hilariously strange (you'll see what I mean below). SHORTY looks to be GeGeGe no Kitarō's main character, Kitarō. What totally makes this figure is the little eyeball companion (which I found out is actually his father in the GGGnK story). I'm not sure which characters all of the other Yuckies are copied from, so if you know, be sure to leave a comment! KING DEVIL looks like he should be some sort of monster leader or supreme baddie. 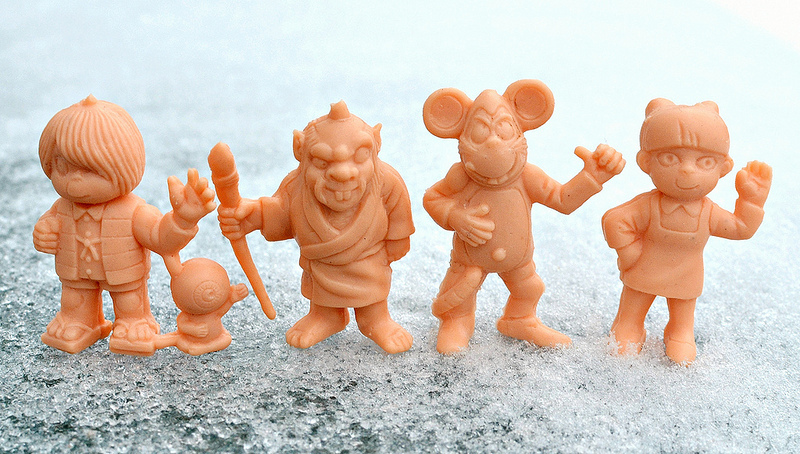 MOUSE MAN is so cool that he can bring you friends and playmates (the booklet says so!). BETH just looks like a human little girl and is a bit too normal compared to the other figures. PAPAW...a.k.a. old scrotum-chin. STONE MONSTER is one of the best -- love the ghoulish face on this furry fiend. INVISIBLE DEVIL is a weirdo ghost with long hair and a creepy grin...and apparently, you should make a wish on him on Sundays. HAIRY is another favorite...just love the fun texture and detail of this sculpt. TRICKY MONSTER looks pretty demonic for something that's supposed to help make my wishes come true. Look at those eyes and that huge tongue -- creepy. FIRE DRAGON is one of the most detailed sculpts, and reminds me of a naga. WATER TURTLE seems to be a kappa. Check out that bio..."You can't ask your Water Turtle to grant you a wish if it is unreasonable." Nice of them to add that disclaimer. SLEEPY just might be my favorite Lucky Yuckie. I love how it looks like a cross between a demon and a Garbage Pail Kid. And that's all! I have to say, Lucky Yuckies are some of my favorite vending machine toys ever. Do you remember these from back in the day? What do you think of 'em? Lovely. More plastic monster goodness. I only recently heard of GeGeGe no Kitaro with the recent passing of its creator Shigeru Mizuki. I would love to read the horror manga. I didn't realize the creator had passed recently. GGGnK is one of those things I always want to research more but never seem to get around to. Great post, I somehow never learned about this line before! -Papaw is Kamaitachi (鎌鼬) - he has flappy lips to blow gusts of air, turned into a chin looks like. Thanks for the character IDs!